Vinod Ganpat Kambli ( pronunciation (help·info); born 18 January 1972) is a former Indian cricketer, who played for India as a middle order batsman, as well as for Mumbai and Boland, South Africa. He is the first man to score a century in a One-day International on his birthday. Despite having the highest career batting average for an Indian test cricketer of 54  he played his last Test when he was just 23 years. He was not even considered for Test cricket and only considered for one day cricket. Currently he appears as a cricket expert and commentator on various television channels. He has also appeared on various reality shows and done few serials and Bollywood films as an actor. He played a supporting role in the Kannada film Bettanagere. He shared an unbroken partnership of 664 runs with Sachin Tendulkar in a school cricket match against St. Xavier's School, Fort. Kambli contributed 349 runs before their coach Acharekar forced the pair to declare the innings; he then took six wickets for 37 runs in St. Xavier's first innings. Kambli started his Ranji Trophy career with a six off the first ball he faced. He made his One Day International and Test debuts in 1991 and 1992, respectively. In Tests, he made four centuries including two double-centuries. He also holds the record for the fastest Indian player (14 innings) to reach 1000 runs in Tests. He made his ODI debut in 1991 against Pakistan during the Wills Sharjah Trophy. He played world cup tournaments in 1992 and 1996. He has 2 ODI centuries in to his credit: 100 not out against England at Jaipur in 1993 on his birthday, setting the record for becoming the first batsman to score an ODI hundred on his birthday and 106 against Zimbabwe at Kanpur in the 1996 World Cup. An innings-by-innings breakdown of Kambli's Test match batting career, showing runs scored (red bars) and the average of the last ten innings (blue line). He played for Boland province in the South African domestic circuit. Vinod Kambli first married Noella Lewis, who was working as a receptionist at Hotel Blue Diamond (in Pune) in the year 1998. After separating from her Vinod Kambli married fashion model Andrea Hewitt. The couple has a child born in June 2010. After his marriage to his second wife Andrea, Kambli converted to Christianity, naming his son Jesus Christiano Kambli. Despite his conversion Kambli stated that he still respects all religions. Journalist Kunal Purandare has penned his biography called Vinod Kambli: The Lost Hero. 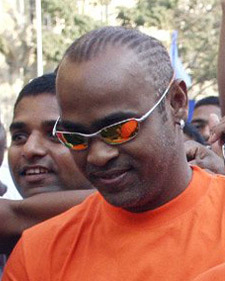 Vinod Kambli made his debut on the small screen on DD National in a serial called Miss India in 2002. He also was a contestant on Bigg Boss. 1 England Sawai Mansingh Stadium, Jaipur 19 January 1993 100* (149 balls: 9x4, 1x6) England won by 4 wickets. 2 Zimbabwe Nahar Singh Stadium, Faridabad 19 March 1993 80 (75 balls: 8x4, 1x6) India won by 67 runs. 3 Zimbabwe Nehru Stadium, Pune 25 March 1993 47* (62 balls: 5x4) India won by 8 wickets. 4 South Africa Punjab Cricket Association IS Bindra Stadium, Mohali 22 November 1993 86 (116 balls: 10x4) India won by 43 runs. 5 United Arab Emirates Sharjah Cricket Stadium, Sharjah 13 April 1994 82* (66 balls: 4x4, 3x6) India won by 71 runs. ^ Kunal Purandare (2011). Vinod Kambli: The Lost Hero. Har-Anand Publications. ISBN 978-81-241-1582-4. Retrieved 31 May 2012. ^ Ashish Magotra. "Kambli to play in South Africa". Rediff.com. ^ "Birthday bullies, ODI oldies and poultry-laden Tests". ESPNcricinfo. Retrieved 6 June 2017. ^ "Records / India / Test matches / Highest averages". Cricinfo. Retrieved 8 March 2017. ^ Tarun J Tejpal (15 May 1996). "Killing of Kambli". Outlook. Retrieved 8 March 2017. ^ Derek Pringle (8 August 2006). "Kambli the rising star who ran himself out". The Telegraph. Retrieved 8 March 2017. ^ "RHIGHEST CAREER BATTING AVERAGE FOR INDIA IN TEST MATCHES". Cricket archives. Retrieved 8 March 2017. ^ Taniya Talukdar (29 November 2013). "Vinod Kambli suffers heart attack, Kannada debut to be delayed?". timesofindia. Retrieved 27 October 2015. ^ Aravind Gowda (4 June 2014). "Cricketer Kambli set for Kannada film debut". dailymail. Retrieved 27 October 2015. ^ Kavya Christopher (27 October 2015). "Vinod Kambli's Junglee avatar for Kannada film". timesofindia. Retrieved 27 October 2015. ^ India today. Aroon Purie for Living Media India Ltd. April 1993. Retrieved 31 May 2012. ^ "RECORDS / TEST MATCHES / BATTING RECORDS / FASTEST TO 1000 RUNS". ESPNcricinfo. Retrieved 12 August 2017. ^ "Birthday hundreds, and the fastest to 2000 Test runs". Cricinfo. Retrieved 25 May 2017. ^ Pushp, Pushkar (24 April 2015). "Birthday Bashes: Cricketers who made it big on their birthdays". Sports-nova | Live Scores, Current Sports News, Articles and Quiz. Retrieved 25 May 2017. ^ "Kambli awaits Sachin's visit to new academy". ^ Vinod Kambli. uniBlogger.com. Retrieved on 14 July 2014. ^ Story- July 1998. Sabrang.com. Retrieved on 14 July 2014. ^ Times of India. Articles.timesofindia.indiatimes.com (12 January 2010). Retrieved on 14 July 2014. ^ Nishad Pai Vaidya (18 January 2017). "Vinod Kambli: 16 facts about one of biggest wastes of talent in cricket history". Cricket Country. Retrieved 10 November 2017. ^ Chaturvedi, Vinita (12 December 2010). "'Christ has come home!'". The Times of India. Retrieved 10 November 2017. ^ "Vinod Kambli takes on a different ball game". MumbaiMirror.com. ^ Kambli, Yuvraj's father lose in election – IBNLive. Cricketnext.in.com (23 October 2009). Retrieved on 14 July 2014. ^ India today international. Living Media India Ltd. January 2001. p. 74. Retrieved 31 May 2012. ^ "1992-1993 India v England - 1st Match - Jaipur". ^ "1992-1993 India v Zimbabwe - 1st Match - Faridabad". ^ "1992-1993 India v Zimbabwe - 3rd Match - Pune". ^ "1993-1994 C.A.B. Jubilee Tournament - 10th Match - India v South Africa - Mohali, Chandigarh". ^ "1993-1994 Pepsi Austral-Asia Cup - 1st Match - United Arab Emirates v India - Sharjah".